Er Xing Long "Haze Shenron"
Er Xing Long is the first Shadow Dragon fought by Gokuu and Pan during the Shadow Dragon Saga. He is the Two-Star Dragon and represents the element of pollution or toxicity. He was born when Upa (one of Gokuu's old friends) wished his father, Bora, back to life after being killed by Mercenary Tao. 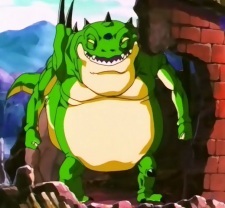 Although he seems to have tremendous durability, Er Xing Long is arguably the weakest among the Shadow Dragons.